-This Freezer is Vertical upright unit programmable temperature range. -4 PIN security lock for unauthorized with Membrane keyboard . 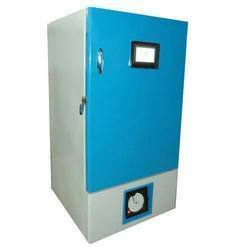 Price Range:- 1, 00, 000 - 1, 50, 000We are engaged in dealing with Deep Plasma Freezer with interior chamber made from stainless steel. Forced air circulation maintains uniformity in the chamber at certain temperature and provides a quick recovery after opening the doors. These freezers are provided with audiovisual alarm that goes on if the temperature deviates from the set temperature. We are one of the leading authorized distributors, traders and suppliers of a wide range of Plasma Freezers that are used for quick freezing and storing of plasma and related blood components at low temperature of -20/-40/-80 ºC. These machines are fabricated using best grade of stainless steel by Skylab. 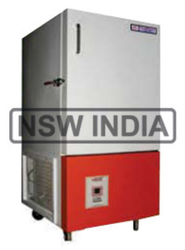 Our range of plasma freezers are widely used in blood banks and research laboratories. - Freezer units are available in Ultra and Base Models with capacity to store 130 Plasma Bags to suit specific requirements of the Blood Centers. - Robust construction Outer chamber is made of Mild Steel duly pre treated & finished with powder coated paint for lasting finish. The purpose of a plasma freezer is to provide a maintained freezing temperature -30°C or -40°C for safe storage of fresh frozen plasma, red cells, cryoprecipitate and platelet concentrates. - Cooling coils are placed between foamed-in-place PUF insulation and brazed to Stainless Steel chamber eliminating any chances of FROST FORMATION and choking of evaporator. - Outer body of CRC Powder Coated. - Inner Chamber of Stainless Steel (SS-304). - Built with industrial quality cabinet construction and extra strength refrigeration compressors. - All models except undercounter include a 6 chart, 7-day temperature recorder standard.